Children are fascinated by the world around them. They want to experience everything, which means they are extremely enthusiastic crafting partners. Fall crafts are a great way to celebrate the change of seasons with your child. 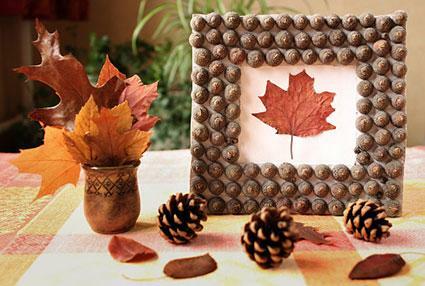 A picture frame decorated with acorns makes a fun addition to your home's fall decor. Gluing acorns to the frame is also an excellent way to help kids refine their fine motor skills. Use glue to attach the acorn caps along all four sides of the frame. Try to glue them in as straight a line as possible. The number of rows you will need for your project will depend upon how thick your frame is, but most frames should require between two and four rows of acorn caps. When the glue is completely dry, add your leaf mounted on white construction paper or a favorite family photo to your frame opening. If you're concerned about the durability of your frame, add a coat of clear acrylic sealer to the finished project. As you're probably well aware, kids this age have lots of energy. Taking them for a nature walk to collect a wide range of leaves is an excellent way to help them burn off excess energy. Take your children for a walk outside. Everyone can pick up pretty leaves and put them in the bag. Talk about the colors you see and the sound the leaves make as you walk through them. When you get home, spread out all the leaves on the floor. Choose the prettiest ones to press between sheets of newspaper inside a heavy book. 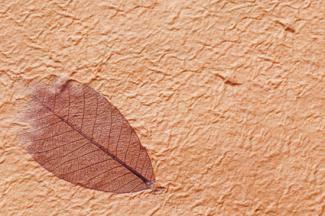 Your leaves will take three to four days to dry completely. When they are dry, carefully glue them to the posterboard or in the pages of your notebook. You'll probably need to wait for a few minutes until the glue is completely dry. Decorate the sheets with markers or crayons. 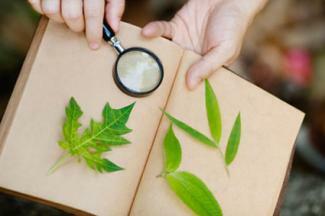 Use a reference book to try to identify the names of the different tree leaves and label them. Scarecrows are symbols of fall for many people and they can be a fun craft to make with young children. Kids this age will be excited to pick out the clothes for your new garden scarecrow. Drive one of the stakes into the ground. Using the packing tape, affix the other stake to form a cross shape. Have the kids stuff old rags into the brown paper bag. Use tape to close the bag and form a head shape. If desired, the kids can draw a face on the bag with the markers or crayons. Attach the bag to the top of the vertical stake, securing with packing tape, to form a head. Use old towels or rags to pad the old shirt and pants to create the arms and body of the scarecrow. You can use the packing tape to keep the padding in place. 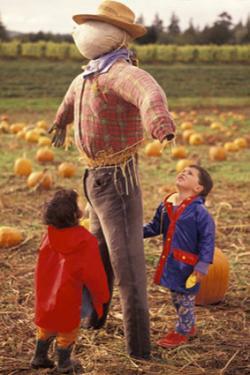 Let your kids help dress the scarecrow by placing the padded shirt and pants onto the stakes. Add the hat and give your new scarecrow a special name. Making handmade paper is a bit messy, but the results can be quite impressive. Kids can use their finished paper for cards, scrapbook papers, or other fun paper craft projects. Fill the plastic tub half full of water. Cut or tear your junk mail, magazine pages, and/or construction paper scraps into tiny bits. Fill the blender halfway full of paper scraps. Pour warm water into the blender to cover the paper. Blend to make a pulp. Pour the pulp into the tub and mix with the water from Step 1. Repeat Steps 2 through 4 until you have three blenders full of pulp added to the tub. Add leaves for decoration, placing them on top of the pulp. Add two teaspoons of liquid starch to the water and mix well. Lower the mesh into the pulp and water mixture then slowly pull it back out of the tub, gathering the paper pulp on top. As you lift up the mesh, take care to keep it level so the water drains through the screen without removing the pulp. Place the mesh on a towel to absorb the excess moisture. Add a second towel over the top to blot up more moisture, then roll over the top towel with a rolling pin to remove the last of the excess water. Remove the towels and place the mesh somewhere safe to air dry. Let your project dry for a few hours, then carefully remove your handmade paper from the mesh. 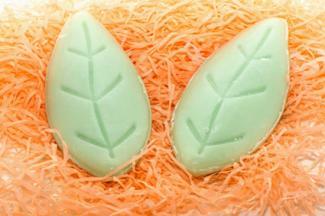 If you've ever made glycerin soap, you know it's an easy way to create wonderful gifts. Making soap with kids requires careful adult supervision, but children love the many colors, scents, and designs they can make. Have an adult use the serrated knife to cut off a few squares of the soap block and put them in the measuring cup. Microwave according to the package instructions. Test carefully to make sure the soap isn't too hot for your child to handle. Have your child help you choose a scent and a color for each bar of soap. Mix a few drops of each into the liquid soap until you reach the desired fragrance level and color saturation. Help your child use a spoon to stir the liquid soap. Pour the liquid soap into the soap mold and wait for the soap to harden. This typically takes about 45 minutes. When the soap is solid, let your child remove it from the mold by pushing gently on the back. The soap is now ready to use. Crafts for preschoolers and younger kids should offer the right balance of hands-on fun and learning opportunities. However, it's important to keep safety in mind. Don't forget to keep an eye on your children as they use scissors or perform other big-kid tasks.